A stall with a difference. It has been 100 years since women in Ireland fought for and won the right to vote. Now it’s our turn to fight and vote for bodily autonomy by repealing the 8th. 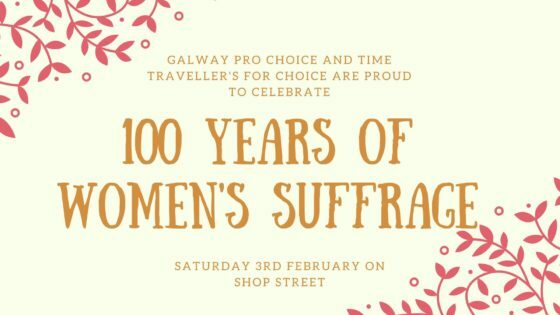 To commemorate the centenary of women’s suffrage in Ireland and Britain and Countess Markievicz’s 150th birthday, Galway Pro-Choice and Time Travellers for Choice will be holding a historical stall on shop street. 1918 was the first time that women in Ireland were permitted by law to vote and stand in parliamentary elections. It was also the year in which the first woman was elected to the British Parliament at Westminster, Countess de Markievicz, she never took her seat at Westminster. Instead, she joined the revolutionary first Dáil, becoming the first female TD. You will see us at our stall this Saturday on Shop Street in period themed clothing. We hope that you come by to say hi, have a chat, and learn more about our fight for reproductive rights in Ireland!